There are few gaming franchises that can stay as consistently relevant and enjoyable as Mario. The plump little plumber has raced go-karts, competed in the Olympic games against Sonic the Hedgehog, and is always down for a party, or two, or eight, or ten. Apart from Super Mario Galaxy 2, the main series Mario titles really haven't placed a number next to their name for almost three decades. Despite that, Super Mario Odyssey feels very much like a sequel to each of the 3D platforming titles that have come before it. Apart from a few tiny issues, Odyssey might very well be the greatest Mario game of all time, offering dozens of hours of platforming bliss with constant rewards around almost every corner. As has come before it, you are on a mission to rescue Princess Peach, who, as always, has been captured by series antagonist, Bowser. As Mario is about to save the day, he is cast down into the clouds below after being smacked down by Bowser's spinning white hat. It is here, in Mario's defeat, that you meet Cappy, a living hat that can possess creatures and objects around him and place Mario in the driver's seat. Cappy is the main gameplay hook here as you'll possess everything from a rampaging T-Rex, a hungry Chain-Chomp, a man-hole cover, or dive into the deep blue as the iconic Cheep-Cheep. Hell, there is even a level where you will possess a giant piece of meat. As you inhabit these characters, each of them will proudly display Mario's mustache, letting you know that Mario is in fact still present in some small way. It is a small, but brilliant piece of design that seems like something only Nintendo could do. Mario Odyssey is the biggest and probably boldest Mario title to date and while it doesn't break as much new ground as what Breath of the Wild did for the Legend of Zelda series, it still offers some fresh and new ideas while remaining faithful to the platforming aspects of Mario 64, Mario Sunshine, and the Mario Galaxy series, with a few beats of old-school Mario thrown in for some good ol'fashioned fan service. Together with Cappy, Mario will travel to over a dozen new worlds, each of them far different than the last. There's the Cascade Kingdom, where running past the giant waterfalls will splash droplets of water all over the screen, the sunny beaches of Seaside, the busy streets of New Donk City, to the bright and colorful Luncheon Kingdom, which is composed entirely of crystalized food. While most of these locations are giant and sprawling environments with secrets packed so densely together, there are some kingdoms that are drastically smaller and offer little in the way of exploration. While many of these worlds are wonderfully designed and have interesting gameplay moments, I found the Lost Kingdom to be the weakest of the more gameplay-centric worlds. I couldn't get into the design of the world and the music was also just not working for me. I was also surprised that there wasn't a traditional haunted house level, as while the Cap Kingdom can give off that kind of vibe, I was surprised that a staple in the Mario series wasn't given some sort of treatment here. With Cappy at your side, or rather, on top of your head, you will throw him to either combat smaller foes or take control of various enemies to utilize their abilities to solve puzzles or navigate certain platform requirements. You can throw Cappy straight ahead, in a circle to tackle large groups or use him to jump higher and perform platforming gymnastics to reach places far beyond the scope of a simple jump. While you can play Odyssey with any setup of controllers, the game does rely heavily on its motion controls through the Joy Con's, detached from the system, and will constantly remind you of it. There are some small moments in the game that can only be progressed via motion controls and it makes me wonder if Nintendo is really wanting to embrace the portable nature of their system. While the detached setup isn't that bad of a way to play the game, I found it far more enjoyable portable with the Joy Con's attached, with the Pro Controller coming in a close second. If playing on the TV is your ideal way of enjoying the game, the Pro Controller is easily the best fit for the big screen fun and either format runs at a solid 60 fps. Super Mario Odyssey, for the most part, controls extremely well. I had some issues where the way I would jump from platform to platform would trigger the backflip and cause Mario to fall to his doom, or he would bounce or slide off a wall when I wanted him to perform another action. There are some moves with Cappy that didn't work as well with the motion controls as I would have liked, but as I mentioned, I preferred playing either attached and portable, or via the Pro Controller on the TV. While the 3D Mario titles have almost always had a solid camera, I found that the one here required a lot of manual movement to let me get an angle that worked better for a jump than the one provided, but it was somewhat rare for me to have to really maneuver it that much. 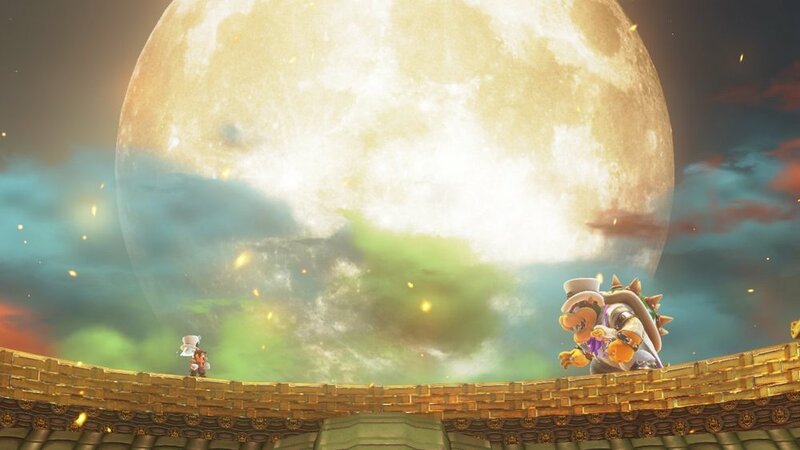 As you explore each new world, you will need to track down Moons to power your ship, the Odyssey, a hat-shaped vessel that is your ticket to tracking down Bowser. Each level is packed to the brim with these collectibles and many of them can only be collected after you have beat the game. The designs of each world compliment this treasure hunt as you'll be swinging the camera all over each kingdom as you attempt to pinpoint and locate each and every secret area offered. While collecting Moons can be a very enjoyable and even addicting aspect to the game, I found that the main story offered more of a guided tour experience than I was expecting. Most locations are built to have certain paths to follow with certain characters needed to reach certain areas to complete each kingdom. I compare much of the design of these puzzles and locations akin to having a square peg for that square slot in front of you. I wish the main campaign offered as much variety in progressing its narrative path as it does for tracking down the 800+ moons available in the game. While the game would need to be massively changed in respect to its level design, I almost wish that possessing these characters would allow you to then change into them anywhere at any time, even if the level didn't require their specific abilities. By having them only accessible at certain times it can limit how experimental you can be in certain levels. For example, if I wanted to be Dry Bones, there is only one small section in the game where I can even see the character. I would even have been ok if this aspect was only available after beating the game because there are so many levels I would have love cutting loose as the T-Rex and I can just imagine a Mario-possessed T-Rex taking on Bowser. That being said, the gimmick of controlling a wide range of characters to solve puzzles, discovering moons, and their use for certain platforming needs is enjoyable and many of them work well via the standard gameplay you would expect from a 3D Mario game. There are a few that are not as fun as others, but flying around as Dry Bones, driving around in a tank, or rampaging as a T-Rex are some of my favorite moments in the game. What I also enjoyed was how many of the bosses you could actually fight as one of the possessed characters. One of my favorite bosses in the game was a mechanical centipede and you'll combat this giant menace in the Sherm-Tank. I also loved taking down the purple octopus with the tiny squid that can fly around by shooting water as a form of a jetpack. 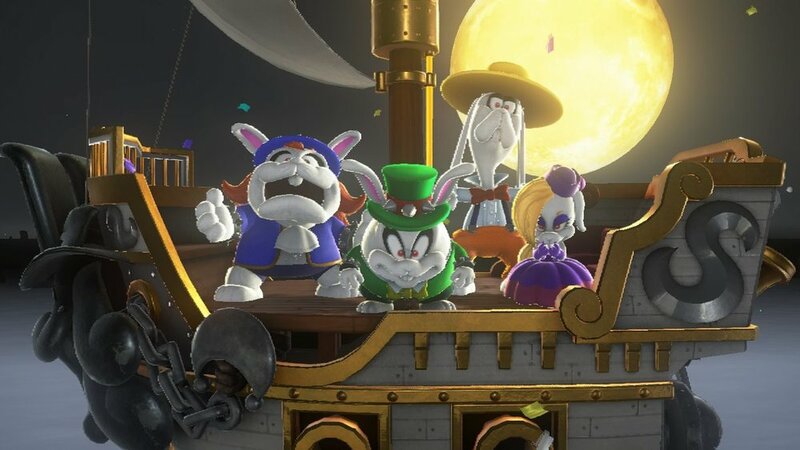 While I do enjoy each of the boss encounters, I didn't really care for the Broodals, a group of rabbits that serve as Bower's wedding planners. These characters and the roles they serve in the game felt perfect for the Koopa kids and frankly, they would have been far more memorable here than these characters, who frankly, don't really look like they fit in the game. I did enjoy their battles and the mechanics that come with them, but the characters themselves just didn't do it for me. There are numerous gameplay moments here where you'll enter a green pipe and convert the lush 3D visuals into short 8-bit moments that not only pixelate Mario, but the music playing as well. These areas are fun and clearly inspired by the original Super Mario Bros on the NES. If not for the incredible final gameplay segment in the campaign, the 8-bit moment at the end of the New Donk City world would have been my favorite moment in the game. These little moments are really enjoyable and add to the flow and charm of each world they are implemented into. As you attempt to track down all the various Moons, either during your adventure or after you have beaten the game and then look to revisit the prior Kingdoms to unlock more, you have both gold coins and purple coins to add to your collection as well. Gold coins function as the amount of lives you have, losing 10 each time you die, but there isn't an actual game-over screen as dieing with zero coins has no penalty at all. You will also use these coins to purchase health items, Moons, or various costumes and items to decorate the inside and outside of your ship. Purple coins are harder to come by and operate the same way, unlocking their own share of these items as you can afford them. Shops will update as you revisit prior worlds or collect more Moons as you attempt to collect them all. The outfits you unlock for Mario are really fun and goofy, should you mix and match, and even if you don't. You can dress Mario up as a construction worker, a doctor, a cave man, or even have him run around in Peach's wedding dress if you should so choose. There are dozen's of outfits and they are all free to unlock in-game, no real money required. That being said, should you have the Super Mario Odyssey Amiibo's or many of the other Mario themed figures, you can unlock several outfits right away as opposed to unlocking them once you have reached a certain number of Moons. Super Mario Odyssey is clearly inspired by nearly every main series Mario title that has come before it. Its visuals, its musical choices; especially the two tracks with actual lyrics, are incredible. Regardless of playing this portable and on the go, or on the big screen, Nintendo has crafted a gorgeous platforming experience. There are some small bumps along the road with some control aspects to which format of controllers feels more natural and its over-reliance on motion controls, but frankly, you can enjoy a vast amount of the game without so much of a wiggle of either setup. I have small issues with other aspects of the game, which I have already mentioned, and they rarely, if ever, get in the way or drag down the enjoyment I had with the title. Super Mario Odyssey is a must-own for the system and feels like a greatest hits of the best qualities of previous Mario classics. super mario odyssey WAS PURCHASED BY THE REVIEWER.